Here’s a link to the Eagan mirror post I mentioned in the video: Pottery Barn Eagan Mirror Knock-Off…and I’d love to know which was your favorite of the four if you feel like sharing! Hi Layla, I love ’em all, but if I had to pick one, I would choose look #3. I LOVE the old window and that it is a family heirloom makes it even better! I love the simplicity of the sign and the little stars !!! Have a great xmas and can’t wait to see the new wall . LAYLA!!!! I don’t want these vlogs to end! I have elements of all 4 that I love so much! I love #1. I just think the darker sign pops against the pretty blue wall. Such fun! Enjoying your vlogs so much and inspired to do “something” with my double sided fireplace–which doesn’t have either mantle! Ideas?! Thank you Layla! You made my week with your mantel vlogs. 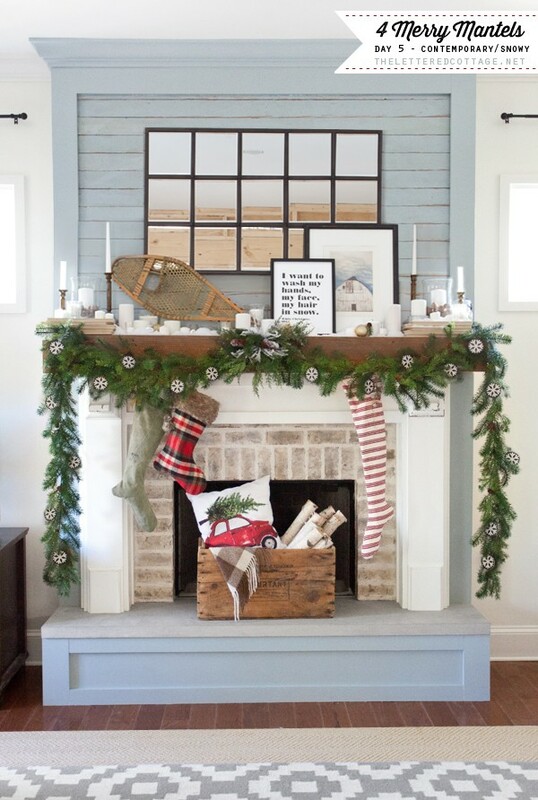 They were all great inspiration, but I think the snowy mantel is my favorite. Merry Christmas! LOVE the videos! and loved each one of the mantels! I loved this video series! I would have to say my favorite is the coastal inspired but they were all really great! You have me on the hunt for my own piece of architectural salvage up here in Canada! Can’t wait to see the tree! Very hard to choose! I am picking the coastal/sign theme, though – you know I’m a beach girl!! Now, I’m leaving before I remember how much I miss snow…love ya’! I love them ALL, but if I step back and look at the 4 photos #1 makes me the happiest. I think it’s the contrast and the whimsy of the different font letters that makes it for me. #1, no #4, no, #1, no #4…oh dear!! Love the videos…hope you will do one for your tree! They’re all fabulous! I just love your style. Each one is my favourite until the next comes along ha! If I were forced to choose,I’d have to say look 3 as I love the window and the meaning behind it. Loving these vlogs so much (someone give this girl a show!) and hope you continue them. You’re a total natural in front of the camera. Today’s mantel is my favorite. I think the song lyrics did it for me. All of the mantels are fabulous – and I would not turn any down in my home, but number 4 just touched my heart! I have a stacked rock fireplace with NO mantel – and a flat screen television above it. How do I decorate that? Love them all, but Coastal is my favorite. What can I say, I am Cali gal. It’s in my DNA. lol!! Great job. Loved them all.. The last one would be my fave though. Your seriously great at this…Merry Christmas!!!! #3, but oh, the snow of #4! I think I gasped when you added that, it looks so pretty! Please do one about your tree! Love the Merry Mantel Series Layla! Watching each vlog was like getting to open a present every day. Happy happy!!!!! Like Them all. Favorite #1 for the sign, #4 for all the black and white. Weekend blessings???? I have to say that I like them all, but love the snowy contemporary most of all. They’re all so lovely but COASTAL is my favorite! I have a little cottage of my own and I’ve been adding more beachy accents to my home over the past few years so that’s where I’m at these days. I need to give honorable mention to that salvaged Gothic window. Yum! What a treasure. And the photo of the barn…oh my! Love it! I love them all. I love the vlogs too. Loved watching the blooper reel at the end!!! What a fun surprise. Great editing, great music, great hostess, great ideas… great, great, great!!! I am having withdrawals already. Love them all… but I like #4 the best … Merry Christmas! Love them all but #3 is my favorite. I would mix the top of # 3 with the # two’s garland and add red berries too. I think it’s safe to say that we all want more Layla vlogs for Christmas this year! I can’t possibly choose! I love them all and I have SO enjoyed this vlog series. I’ve looked forward to them each day. Please don’t stop doing vlogs. I’m not the most crafty person, but watching you explain things, makes me think “I can do that!” Thank you for inspiring me and many others. 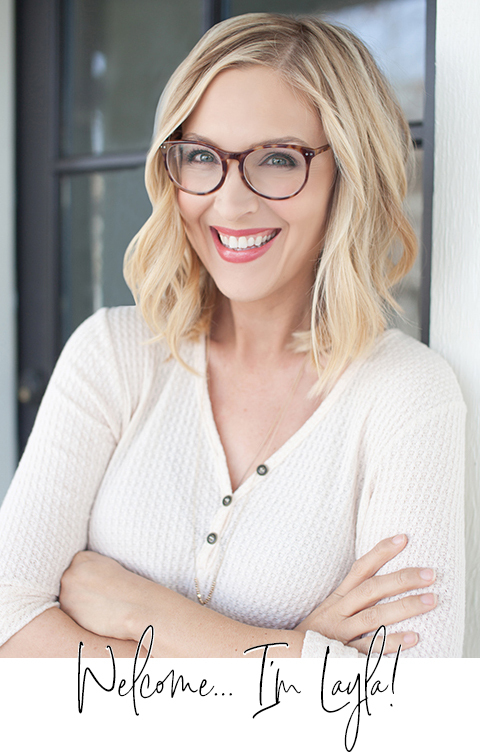 Love your style…completely! Keep the vlogs coming, we are all eager students ? Hi Layla! Thanks for you video and sharing ideas for decorating this holiday season. I really love them all and i really enjoyed watching your videos! You are so creative and very crafty! Keep doing vlogs and inspire others. Thanks, Layla! Number 1 and 3 are my favorites! Layla you are positively adorable! LOVE the vlogs (please keep them coming)! All of the mantels were beautiful and you make each one look so easy and “do-able”. Thanks for sharing! Oh, how I loved this series! The coastal look was definitely my favourite and I wish wish wish I could put it in my house! But, I live in Darwin in the top, steamy part of Australia and as it’s usually at least 30’C here all year ’round I don’t have need of a fire/mantle. Seriously thinking bout a faux one for next year, though. I. Am. Inspired. Thank you! Have a merry Christmas ? #3 because the window reminds me of a church window. And also #2 (one of my favorite verses)! They all look great and gave me some good ideas for my own fireplace:) Thanks for sharing with all of us! Firsts off, you are the greatest. I love your enthusiasm and creativity. I loved all of them but probably the last one, snow, wins out. Thanks for sharing you time with us. Happy Holidays and Peace to you and yours! I was hoping you might do one that would incorporate the four weeks of advent; Hope, peace, joy, love. Your creativity never ceases to astound me. I suspect next year will be a kid-themed mantel which I look forward to with my whole heart for both of you. What a great series! I loved the videos and those mantles are so pretty 🙂 You always make your videos fun. Hopefully this link will take you to the last page of the Pier 1 Holiday book – which displays a really lovely Christmas mantel, with a simple yet stunning red and green theme and a few gold accents. I was rather hoping one of your Christmas mantels might be a little something like this. 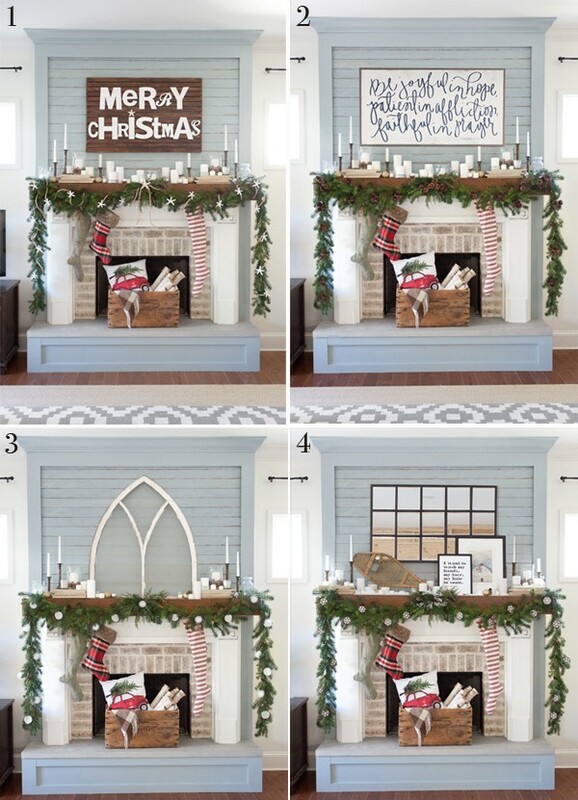 However what you came up with is also lovely and I really love that you put together 5 mantels! My thought in sending this, is perhaps you might enjoy a little look at someone else’s creativity.